Today is Dave Brown Day in Memphis. 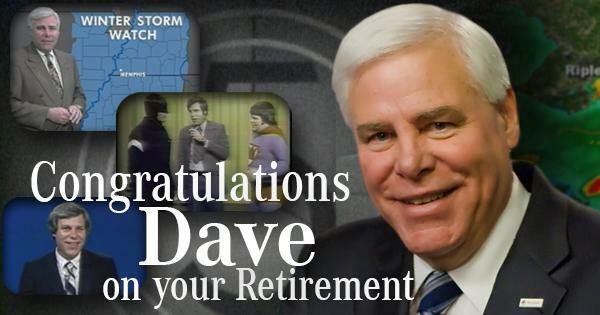 It's a bittersweet day for many as a longtime voice of calm and reason in the midst of weather chaos retires from WMC Action News 5 after 38 years (wow!). I first met Dave over 20 years ago when I was in high school, preparing to head to college to begin a career in weather. Many of our encounters over the years have been via the local chapter of the American Meteorological Society, of which we are both members and regular attendees. Looking back on the last couple of decades I have known him, the one word I would use to characterize Dave, the one that seems most fitting, is genuine. You see, our AMS chapter membership is not just local meteorologists. It includes a large number of "Joe Publics," people who just have an interest or hobby in weather, maybe own their own weather stations or browse the computer models just like those who have a career in the field, but who have jobs doing other things. They attend to learn and socialize with others who have the same hobby or passion, which also happens to include many of those in the meteorology sector (public, private, broadcast, etc.). Dave has been the most regular TV weathercaster at these meetings over the years and, to a person, he always greets those who attend - from teenager just beginning in the profession to long-time retired civil servant - as if he was just another hobbyist and friend, not a local weather legend with his own bobblehead. Who Dave appears to be on TV - the reassuring figure who would be just as comfortable sipping a glass of iced tea with you as broadcasting into your living room or bedroom during a tornado outbreak - is exactly who he is in real life. He is genuine, friendly, and as down-to-earth as they come, never passing up a moment to deflect praise for this work to others. He was that person when a certain young boy in his teens (yours truly) with a fledgling passion for weather showed up for his first AMS meeting, just as he was a few months ago at another meeting, when the same young man had become established in the local weather community. We'll all miss watching Dave Brown on channel 5. But I also happen to know that the Storm Tracking Team is in good hands. Ron Childers, who has been a great supporter for me personally and has been "in training" for the role of chief meteorologist at WMC for 25 years, takes over the reins, leading a younger, but just as capable and passionate, team of meteorologists. I am certain Dave will enjoy a little slower pace, perhaps sipping sweet tea on the patio and listening to the thunder rumble without worrying about having to drive from Lakeland to Union Avenue to step in front of the camera and reassure his devoted viewers with that calming demeanor. Best wishes to a living legend! I look forward to hearing about "retired life" at the next AMS function, as I'm fairly certain his passion for weather will lead him to a meeting or two, despite now holding the title of "emeritus." 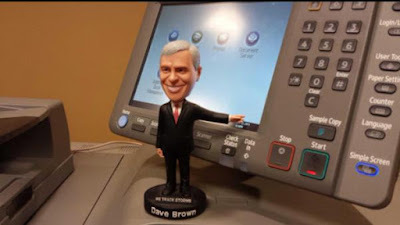 What are your thoughts or recollections of Dave Brown and his career? Comment below! 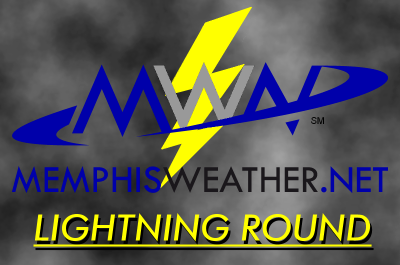 Decided it would be a good idea to hit a few topics all at once today, so here comes another edition of the MWN Lightning Round! I don't know many people complaining about this week's weather. For late August, you can't be disappointed with morning lows in the 50s for many, afternoon highs in the mid 80s, abundant sunshine, and low dewpoints! We have one more day to copy/paste that forecast, then humidity starts creeping back up as wind shifts back to the south. By this weekend, we'll be back to "near normal" for this time of year - lower 90s afternoons, lower 70s morning, and a little more humidity. 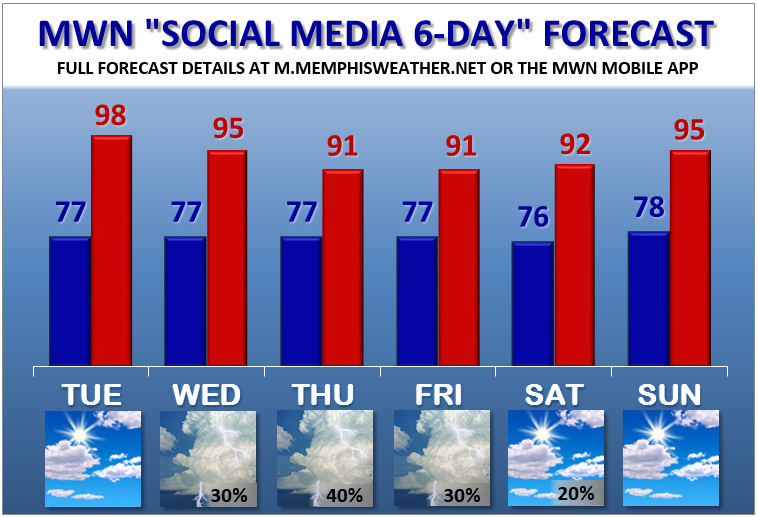 The good news is there still is no appreciable rain chance in the 7-day forecast. Looking further out, NOAA thinks the first 10 days or so of September will feature slightly higher rain chances and above normal temperatures (which means 90s). Don't worry, this week's weather will be back before long! Fall is not too far away! Temperature outlook for September 3-9, 2015, which shows a 70% probability of above average temperatures in the metro during this period. Summer may not quite be done! About a month ago, Memphis International Airport (KMEM) achieved an important designation. No, not the first airport with a "Grit and Grind" spokesperson, but the first airport in Tennessee (and only the 16th nationwide) to earn the "StormReady" designation from the National Weather Service. From the Airport Authority newsletter, the designation is "for demonstrating excellence in the preparation and planning for severe weather." Jim Belles, Meteorologist in Charge of the NWS's Memphis Forecast Office; Cedric Simon, Memphis Int'l Operations Duty Manager; Stephen Kearney, NWS meteorologist; Terry Blue, MEM Vice President of Operations; and Gary Woodall, NWS Warning Coordination Meteorologist. Photo courtesy MSCAA. According to the National Weather Service, "StormReady helps arm America's communities with the communication and safety skills needed to save lives and property--before, during and after the event. StormReady helps community leaders and emergency managers strengthen local safety programs." So the next time severe weather threatens the airport, rest assured that airport officials have a plan and are ready to execute it at a moment's notice to keep patrons and operations safe. As of Wednesday afternoon, Tropical Storm Erika is being affected by moderate to strong wind shear as it moves towards the Caribbean. This shear has weakened the storm and will continue to affect it for a couple of days. However, if Erika can survive the shear, much more conducive conditions await as the storm approaches the Bahamas, and potentially Florida, in a few days. Computer models have narrowed in on a track that takes the storm north of Puerto Rico and into the Bahamas this weekend, while also strengthening it as it leaves hostile conditions behind. From there, it's difficult to say what Erika will do, but those along the Florida east coast will need to closely monitor the system. 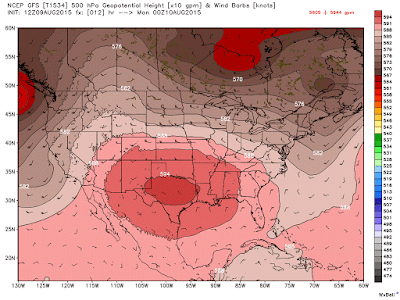 Multiple scenarios take Hurricane Erika up the east coast of Florida early next week. 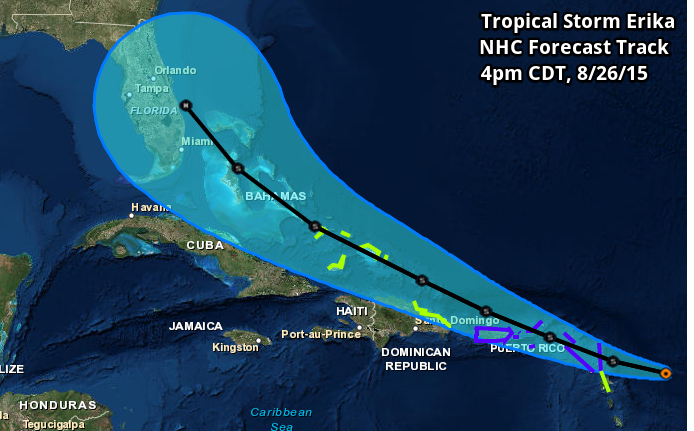 NHC Forecast track for T.S. Erika as of Wednesday afternoon. The last forecast point just off the Florida east coast is valid Monday afternoon and indicates a hurricane with 75 mph maximum sustained wind. By the way, Saturday marks the 10-year anniversary of Katrina's landfall on the Gulf Coast. That year, 2005, was also the last time a major (category 3+) hurricane made landfall in the U.S., a 10-year drought that is unprecedented in the modern era. Hate to say it, but we're overdue. For the latest information on Erika, see the MWN Tropical Page. Though it's a bit early to be looking ahead to autumn, I've had several people comment that they are DONE with the 90s and ready to start looking forward to fall weather - highs in the 70s, lows in the 50s, pumpkin spice at Starbucks... :-) I don't think we're there yet, but we've already lost an hour of daylight since late June and average highs drop back below 90 as the calendar turns to September. 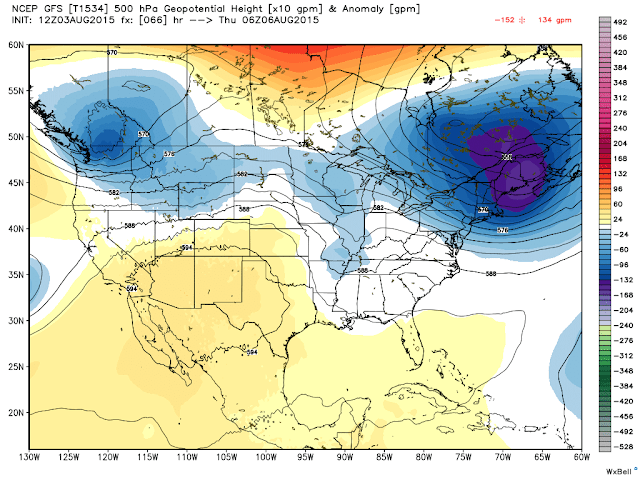 In the meantime, we have a stormy week ahead as a fairly strong upper level trough (for August) approaches, combining with seasonal mid-August heat and humidity to produce a risk of severe weather by mid-week. Before that though, I expect Tuesday to be a similar day to Monday with widely scattered "airmass" thunderstorms that pop up, move little, and rain themselves out during the afternoon hours. High temperatures will be similar to Monday and about normal for this time of year - near 90. Tuesday night begin to see the influence of the approaching trough to our northwest as thunderstorms progress into MO and AR. 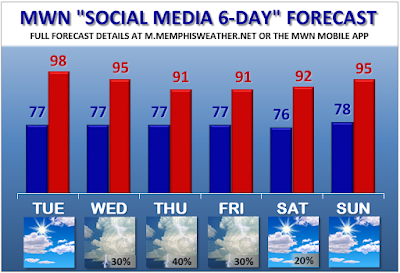 A chance of rain moves into the Mid-South by early Wednesday, but the best chances of thunderstorms will be during the afternoon and evening hours. Model data is still not quite in line with the timing of the front and subsequent impacts, mainly because the front will be slowing down as it nears the Mid-South as the low "pulling" the front ejects north into Canada. 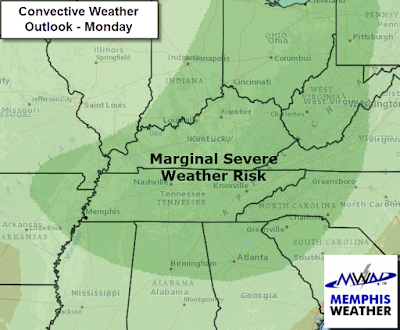 As of Monday night, west TN and northeast AR are under a Marginal Risk (category 1/5) for severe storms Wednesday with the better chances to our north. This will likely change a few time between now and Wednesday afternoon, so stay in touch with MWN for the latest details. 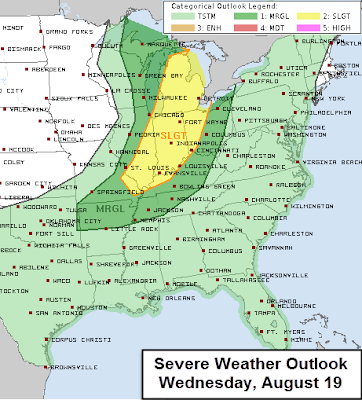 The main severe weather threats will be isolated damaging wind gusts and large hail. Wednesday night activities definitely need a rain plan. Forecast precipitation amounts through Saturday from NOAA's Weather Prediction Center, which indicates 2" or more of rain could fall this week. 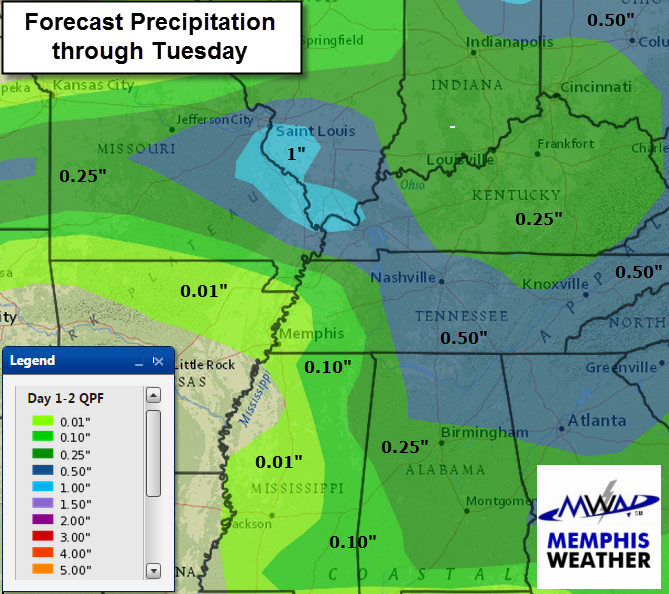 A relative lull is expected Thursday as the front stalls over the region and most of the atmospheric dynamics are well removed from the Mid-South. A few showers or a thunderstorm can't be ruled out however. The best part of Thursday will be the temperatures - some areas may barely reach 80° for the high! Forecast high temperatures for Thursday from the NOAA WPC. While 78° may be a bit cooler than we actually see, temps near 80 would certainly be welcome! To start the weekend, the front remains stalled over the area but pulls back to the north as a warm front on Sunday. Combined with warmer temperatures, scattered showers and thunderstorms will once again be possible, though it is too far out to pinpoint any more likely times. This time of year though, typically afternoons provide the best chance of thunder. Surface map valid Saturday morning showing Wednesday night's front still draped across the area, providing a focus for scattered showers and thunderstorms to end the week. 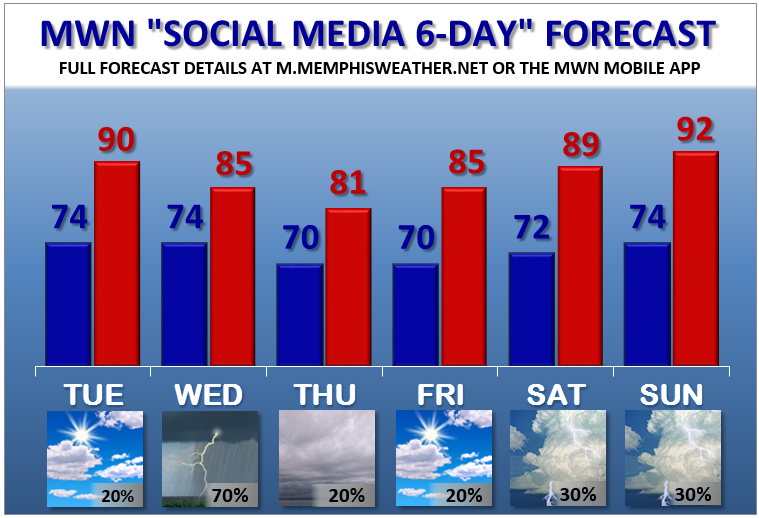 We encourage you to download our mobile apps and follow us on Twitter and Facebook for the latest details and updates on the potential severe weather threat Wednesday. Links are all below. 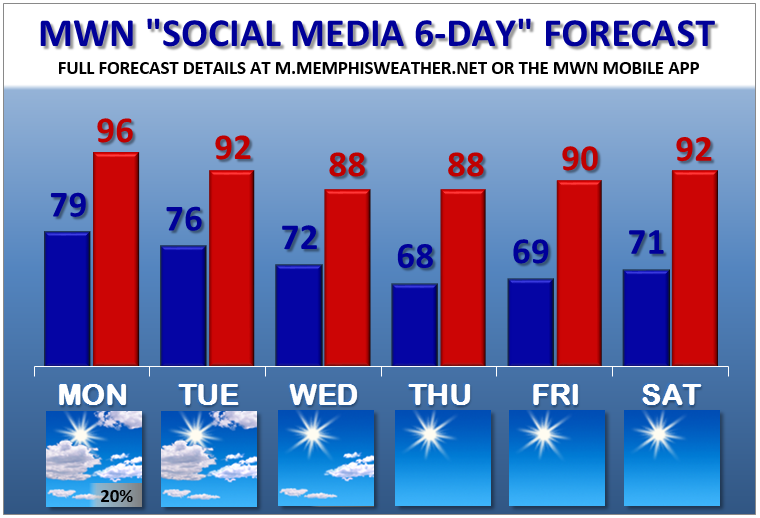 A busy week in the the weather world started hot, included three separate Memphis metro severe weather events, and ends with another hot weekend. However, a cold front and upper level pattern shift early this week promises more comfortable late summer weather as schools resume. The past week included two lines of storms with high wind that resulted in accumulating power outages and downed trees on Wednesday. In sum, over 50,000 MLG&W customers alone lost power between these two systems that moved through late Wednesday afternoon then again just before midnight. As utility crews were busy repairing their infrastructure, temperatures were a bit more comfortable to end the week but ramped up this weekend with Heat Advisories back in place. In addition, one additional line of storms moved through the metro about rush hour Friday morning, sporting a very photogenic shelf cloud and prompting warnings, but doing little in the way of additional damage thank goodness! The shelf cloud Friday morning approaches Arlington in this picture by Laney Borwick. Monday will be the last day of above normal temps and Heat Advisories for most of the area as a cold front and pronounced upper level pattern change ushers in cooler temperatures and much lower humidity by mid-week that looks to last into early next weekend at least. Let's get into the details. Heat Advisories and Excessive Heat Warnings in effect as of Sunday afternoon reflect the heat provided by high pressure at the upper levels and southerly flow escorting high dewpoints from the Gulf into the region. 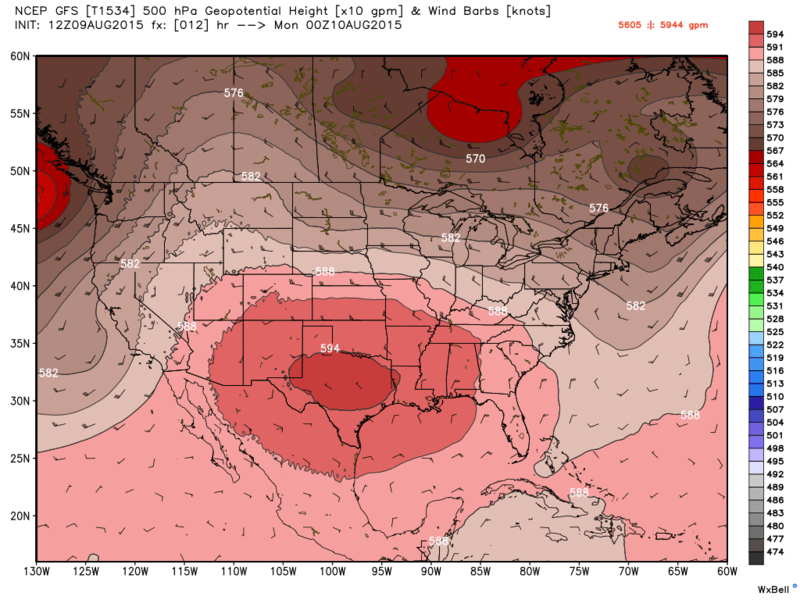 At the upper levels, a large dome of summertime high pressure centered over Texas dominates the southern U.S. 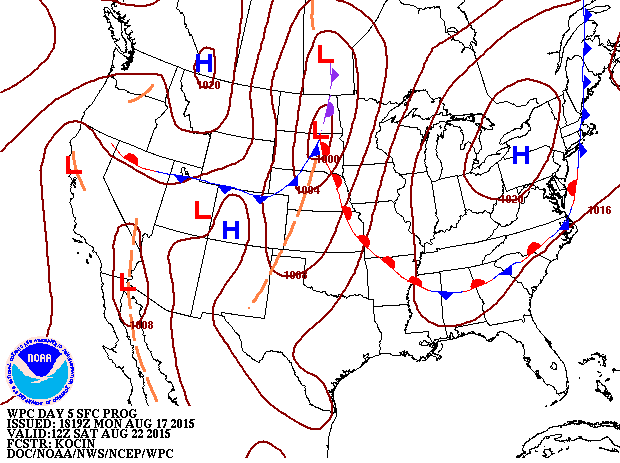 However, as we head into the week, that high pressure will retrograde into the western U.S. while a large trough develops over the eastern U.S. with pressure lowering over the Mid-South in the wake of an early week cold front. As the upper high moves west, heat will abate, dropping temps to below normal levels from mid-week into the early part of the weekend. A good way to visualize the dry airmass that will move in behind the front is by looking at precipitable water (PW), which measures the amount of water vapor in a column of air if it condensed into rainfall and piled up on the ground. In other words, it's somewhat a measure of humidity, only it is not just surface humidity, but humidity throughout the whole atmosphere. The first image below shows PW early Monday evening. Values in the metro (red) are near 2", which is roughly in the 90th percentile for this time of year (meaning only about 10% of the time is it higher than this). However, by Wednesday evening (second image below), those values drop to about 0.75", which is near the minimum observed this time of year! 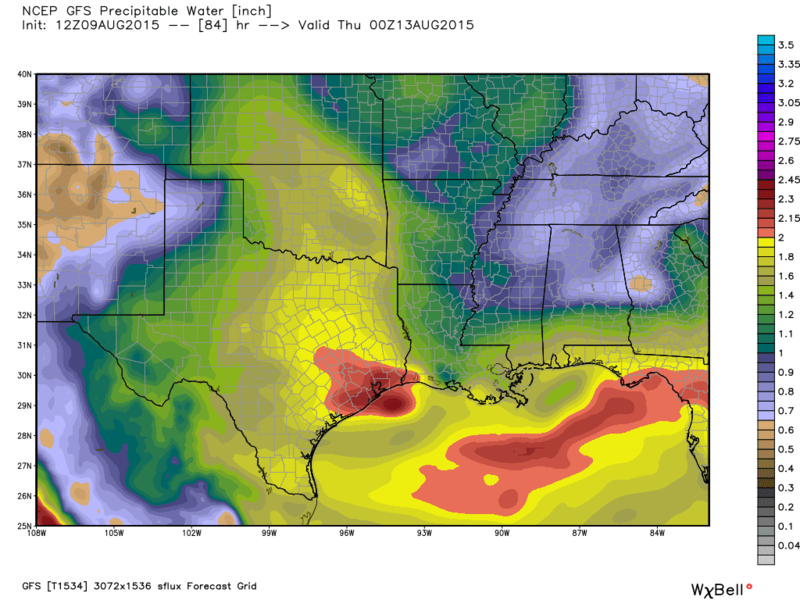 So the atmosphere as a whole will be much drier by mid-week. Precipitable water (PW) values on Monday evening, as described above. Graphic courtesy WeatherBell. 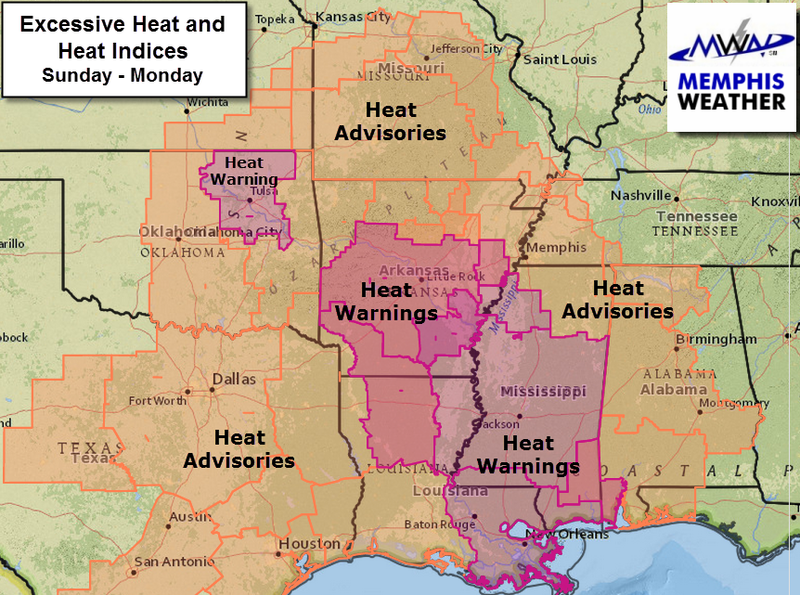 As for what to expect this week, first remember that Heat Advisories remain in effect Monday. Temperatures will again be in the mid to upper 90s with heat indices above the 105° danger level. Take frequent breaks if outdoors and keep drinking water! Below is the forecast precipitation amounts with the frontal passage. As you can see, very little rainfall is expected ahead of the front locally and that will be in the form of widely scattered thunderstorms Monday afternoon and evening. As for the severe weather threat, we are currently in a Marginal Risk (category 1/5), which is low, but not no-existent. The main threat will be that a few storms could produce damaging wind Monday afternoon and evening, though again, not a lot of storms are expected. As for the rest of the week, temperatures will moderate to below normal levels by Wednesday, then back to near normal by the weekend. The 60s temps in the mornings will feel great! Plenty of sunshine is expected with low dewpoints, thus heat indices will not be a factor starting Tuesday. Temperatures and precipitation were above normal the past couple months and that trend continued in July. In fact, daily average temperatures were at or above normal on 16 consecutive, and 24 of 25, days after a cooler than normal week to start the month. Precipitation was well below normal with the exception of 2 days (the 3rd and 23rd) which produced 87% of the total monthly rainfall. Through July, Memphis International Airport has a year-to-date rainfall deficit of 2.64", or about 92% of normal. On July 14th, a complex of severe thunderstorms swept through the metro, downing trees and power lines across southwest TN with wind speeds of 50-60 mph. An 87 mph peak gust was recorded in Atoka, TN. Over 30,000 MLGW utility customers lost power, which took over 3 days to fully restore. Earlier in the month, flash flooding occurred across the metro on the Independence Day weekend as rainfall totals of 3-5" were recorded across the area. 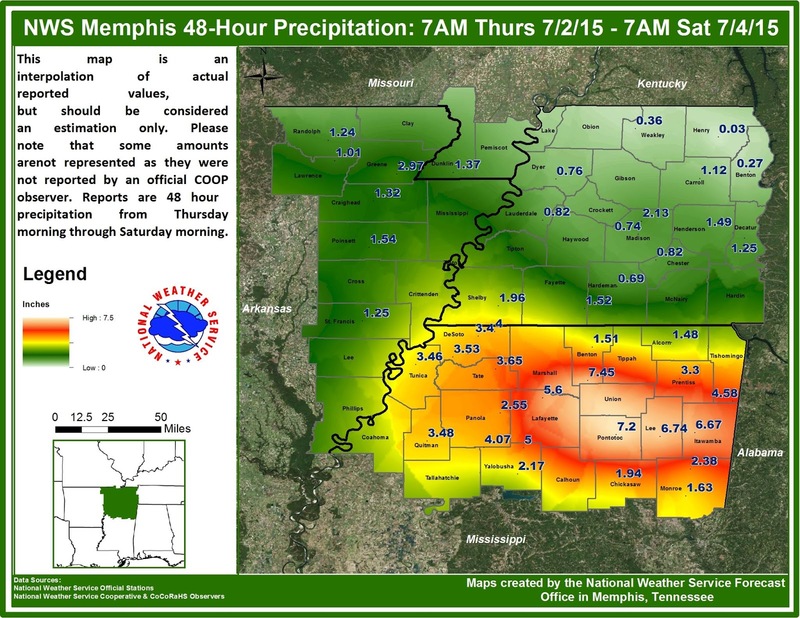 Precip totals for the period July 2-4, 2015. Flash flooding was common across the southern metro. Records set or tied: 81 degrees (20th) - tied record for warmest minimum temp. 82 degrees (29th) - tied record for warmest minimum temp. The average minimum temperature for the month was 7th warmest on record. July 2015 was the 15th warmest July on record. Comments: The first six days of the month were below average, then the rest of the month (except the 23rd which was 1 degree below average) featured above average temperatures. Only one day saw the low drop below 70 degrees (69 degrees on the 5th). Five days had low temperatures at or above 80 degrees. Comments: Over 4.5" of rain was recorded on just two days (3rd and 23rd). 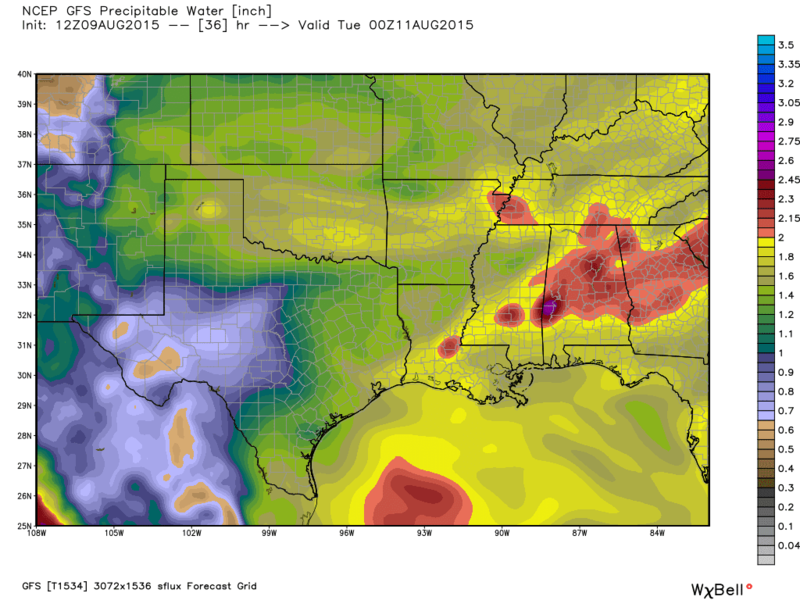 If those two days were discarded, it would have been the 7th driest July on record. Although we enjoyed below average dewpoints to end last week, humidity levels are back near normal for summer with another hot day on tap tomorrow as highs reach the upper 90s. However, the oppressive heat will improve a bit as we head into Wednesday, with high pressure deteriorating and rain chances increasing. A pattern that favors chances for thunderstorms will persist through at least Friday before leading to a mainly dry and fairly comfortable weekend. Lets get into the details of the forecast below. GFS modeled 500 mb (18,000') height anomalies, valid late Wednesday night. Lower than normal pressure (indicated by light blue) over the Mid-South indicates a low pressure disturbance over the area, which brings our t'storm chances. As high pressure retreats on Wednesday, a mid-level shortwave (or area of lower pressure in the middle portions of the troposphere) and weak cold front will be the primary cause of rain chances for the latter portion of the work week. 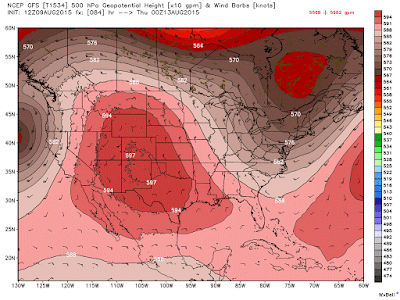 The mid-level feature in the atmosphere allows thunderstorms to more easily form during the heat of the day beginning Wednesday as it draws closer to the region. The strength of this shortwave will also lead to chances of thunderstorms at night (particularly on Wednesday night) providing enough lift to fuel some scattered storms even without the mid-day sun. The best chance of thunderstorms this week could be Wednesday night. Though severe weather is not expected to be widespread, a few strong storms are possible as the potent shortwave moves through. 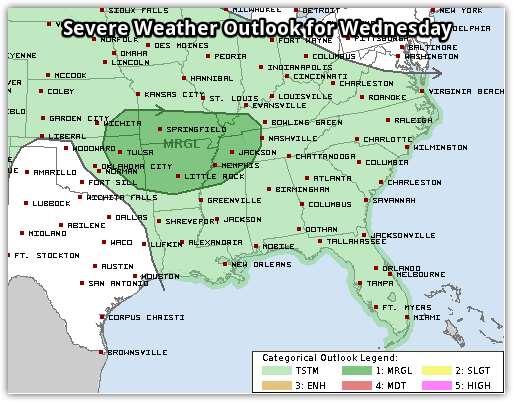 A Marginal Risk (category 1/5) severe weather risk exists Wednesday into Wednesday night for the metro. Widespread severe weather is NOT anticipated at this time. By Thursday, the disturbance will be exiting the region, but with the weak cold front near the area, scattered showers and thunderstorms will be possible Thursday and Friday before high pressure re-builds into the area heading into the weekend. The result will be slightly lower temperatures for the region from Thursday through Saturday. If you happen to get a thunderstorm during the daytime hours, you'll enjoy some relief from the heat, but also increased humidity. Most of Saturday and Sunday look dry and fairly comfortable for early August, though temps start climbing again as we head into early next week. 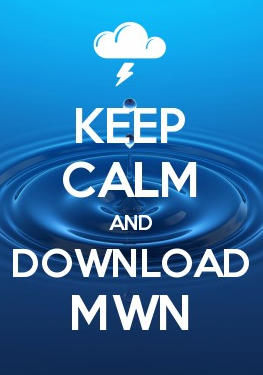 You can check out the full MWN Forecast here or within the MWN mobile app which you can find links to below.